Discussion in 'All Anniversaries' started by Joe Brown, Jan 23, 2015. F/O G. Hill, F/O J. K. Turner (Navigators) and Sgt W.E. Ranger (Airgunner) also lost their lives; F/O K. G. Booth (Pilot) and F/Sgt C. G. Broad were wounded. Wellington NC607 of 69 Squadron undertook a special night reconnaissance of the area Maasneil – Krüchten close to Roermond on the Dutch-German Border on the 23rd January 1945. There were three Navigators: one navigating, one making ground observations from the bomb-aimer’s panel and the other operating the camera. 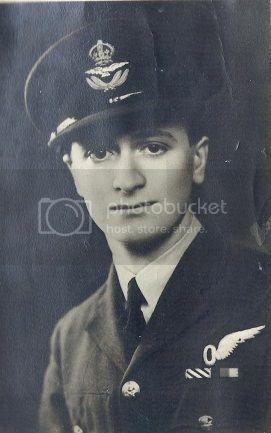 F/O J. W. Lowrie (140 Squadron) had responded to the request for volunteers and was one of the Navigators. A surviving member of the crew reported that having assessed their first observation run over the Maasneil area was not as they required, they went round again at about 1000 feet despite the intensity of the ground fire. This action was typical of their generation: showing great valour and devotion to duty. It is believed Wellington NC607 crashed after it was hit in the tail, causing loss of rudder and elevator control. Four years ago I received an email: 'Hello my name is Ron Cox from the Netherlands Roermond every Sunday I go metal detecting I found some items of the plane that crash there in Kloosterhof maybe if you come and visit Holland Roermond I can show you the crash site'. During the visit I met Mr Louis Cox whose family farm was adjacent to the meadow where the Wellington crashed in the early hours of the 23rd January. He was sixteen years old at the time and he and his two brothers were told by the Germans to bury the three officers in the meadow where the plane had been brought down. They prevailed on the Germans to be allowed to take the bodies of the three young men to the Old Cemetery in Roermond and proceeded to harness a sleigh to be pulled by a foal and began the long journey through the heavy rutted snow to the Cemetery in Roermond. Two of the brothers guided the foal and manhandled the sleigh over the wintry ground while Louis Cox sat beside the bodies of the three officers. At the Cemetery they ensured F/O Lowrie, F/O Hill and F/O Turner were laid to rest beside six other RAF airmen: a small RAF enclave set aside in this Cemetery where Roermond buried their heroes of the Resistance. Sergeant Ranger was buried in Venray War Cemetery, near to the location where the tail of NC607 had fallen. Tears come too quickly to my eyes these days as I look back to the years of the Second World War, but when I think of that little procession with its sleigh manhandled through the icy wintry snow by the three courageous Dutch Brothers determined to honour our Brave Airmen, I am deeply moved. Playmates from our 'toddler years', John and I last spent the day together in April 1943 to celebrate my 'Passing Out Parade' when receiving my Commission into The Royal Scots as a Second-Lieutenant; he already a Pilot-Officer. Have missed my boyhood and teenage friend from Peebles these past 70 years and although 90 I was glad I made the pilgrimage to stand at the spot where his courageous life ended. ‘Per Ardua ad Astra’. He had truly served 'Through Adversity to reach the Stars'. I was wounded at Heinsberg two days after John was killed; only 12 miles from where he had been shot down . . .
Craig lowrie, Guy Hudson, TTH and 6 others like this. Son of George and Mary Lowrie, of Peebles. Son of John Pater Turner and Hilda Beatrice Turner, of Lowestoft, Suffolk. 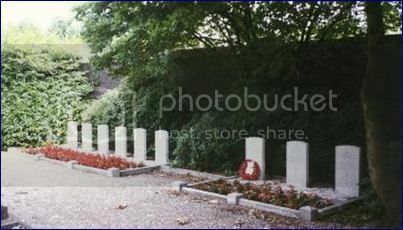 The Commonwealth War Graves, at Kapel in 't Zand Public Cemetery, Weg langs Het Kerkhof, Roermond, where this small enclave of nine RAF Officers and Men lie in hallowed ground. Separately, the three lads buried by the young Dutch Brothers; John Lowrie interred close to the tree. Hi there, my family and I are going to roemond next week and whilst there we will visit my great uncle John lowries war grave, to pay our respects to my great uncle and the other highly respected airmen. Owen and von Poop like this. Thanks for your post. I hope your visit goes well. Sadly Joe Brown won’t be able to post a personal reply as he passed away almost 3 years ago. Sorry to hear about Joe Brown, just back from roermond and visited John and the other airmens graves which was very good especially the way they are looked after by the locals then visted Louis Cox to say thankyou for what he and his brothers did after the crash then visited the memorial to the crash site. Will never forget the visit.